Several outside factors can affect pond maintenance efforts: stagnant water, discarding debris into pond, fertilizer runoff, and shoreline maintenance. Make sure there is some sort of surface agitation of aeration. While some bodies of water are aerated naturally, most ponds would benefit from mechanical aeration. 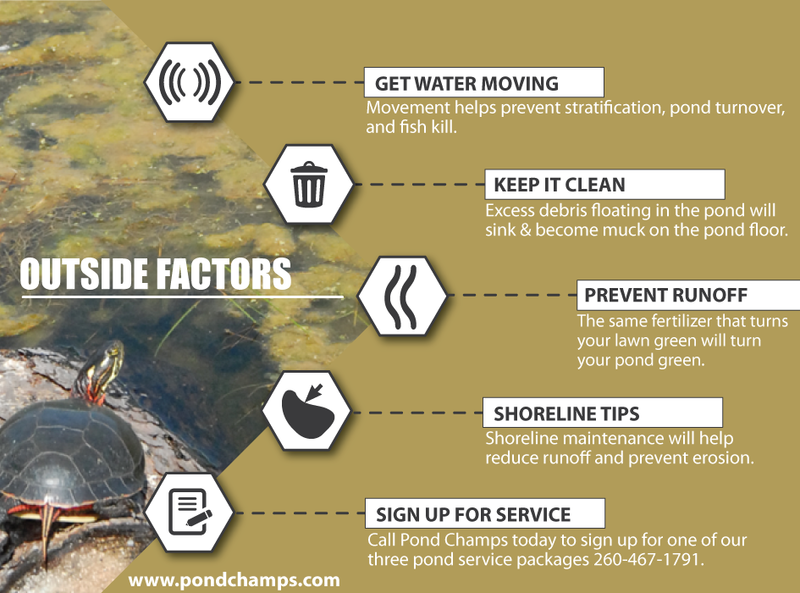 This will help prevent three factors that will cause an imbalance in your pond’s status. These are stratification, pond turnover and the death of fish stock. To assist with this, Pond Champs offers aerator and fountain installation. Do not throw debris into the pond. All excess debris floating in the pond will sink and become muck and organic material on the pond floor. This material will become a food source for algae and weeds. If your pond does have a muck problem, take advantage of our muck removal service, which can be added to any plan. Always mow grass away from the pond so the mower doesn’t throw grass clippings on the pond’s surface. As well, do not deposit lawn clippings, weeds, or trash of any kind into your pond. Christmas trees may be useful for structure in the pond, but make sure you anchor them well and sink them deep. Take care fertilizing around your pond. Fertilizing your lawn ensures it will be lush and green. The same fertilizer that turns your lawn green will turn your pond green, too. This is because excessive amounts of fertilizer entering a pond will accelerate algae and weed growth that will be very difficult to manage and eliminate. When fertilizing your lawn, keep 5 to 10 feet away from your pond’s shoreline. As well, try to use low phosphorous or no phosphorous fertilizer near or around your pond. Keep the shoreline properly maintained. Maintaining the area 5 feet around the shoreline of your pond is crucial to keeping your pond healthy. Reduced mowing will keep the grass longer and will help filter any run-off that may contain fertilizers or other harmful waste products. To be exact, shorelines should have grass at least 4 inches tall along with rocks and additional vegetation. This will filter any harmful products from the pond and will reduce erosion of its banks substantially. If you have a natural edge pond (no rocks), do not request for or self-treat the weed line. Removal of shoreline grass and weeds can give way to further erosion. Lastly, sign up for one of our pond service plans if you haven’t already. Unsure about whether Our Pond Service is for you or not sure about what plan will suit your needs? Call us to speak to a licensed professional. Contact Pond Champs with any additional questions or concerns.